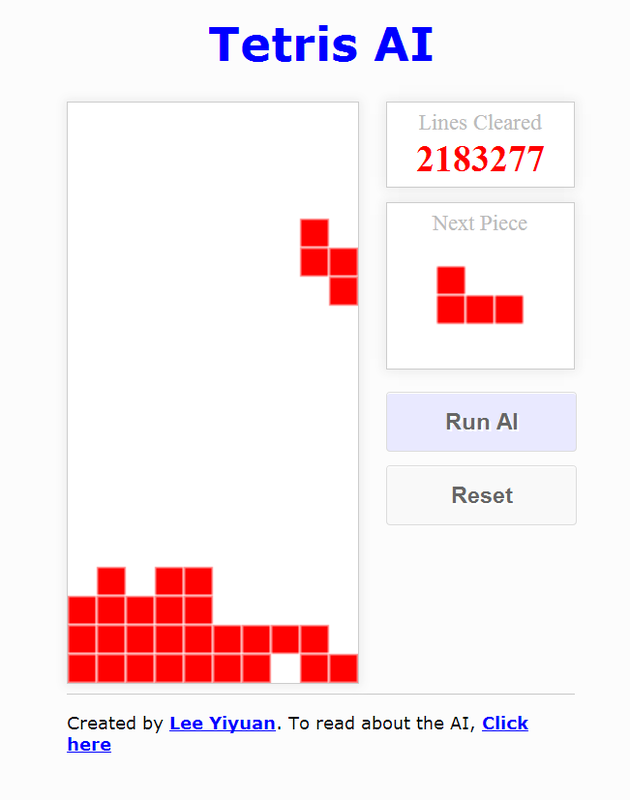 In this project, we develop an AI (online demo here) which can indefinitely clear lines in a single Tetris game (I had to stop it because my lappy was burning out due to poor ventilation at some point in time). Perhaps the most interesting observation I made in the course of developing the AI was this: despite the existence of the “standard” Tetris guideline, there are still many variants of the game. If you were to play a game of Tetris online, chances are that it won’t be the “standard” one. 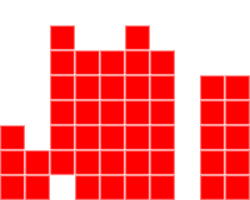 The Tetris grid is 10 cells wide and 22 cells tall, with the top 2 rows hidden. 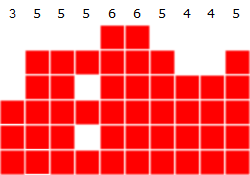 All Tetrominoes (Tetris pieces) will start in the middle of the top 2 rows. There are 7 Tetrominoes : “I”, “O”, “J”, “L”, “S”, “Z”, “T”. The Super Rotation System is used for all rotations. The “7 system” random generator is used to randomize the next pieces. One lookahead piece is allowed (the player knows what the next piece will be). Below shows a table of all possible pieces under these rules. Our goal is to clear as many lines as possible, and therefore, to make as many moves as possible. This heuristic tells us how “high” a grid is. To compute the aggregate height, we take the sum of the height of each column (the distance from the highest tile in each column to the bottom of the grid). We’ll want to minimize this value, because a lower aggregate height means that we can drop more pieces into the grid before hitting the top of the grid. This is probably the most intuitive heuristic among the four. It is simply the the number of complete lines in a grid. We’ll want to maximize the number of complete lines, because clearing lines is the goal of the AI, and clearing lines will give us more space for more pieces. A hole is defined as an empty space such that there is at least one tile in the same column above it. A hole is harder to clear, because we’ll have to clear all the lines above it before we can reach the hole and fill it up. So we’ll have to minimize these holes. The presence of these wells indicate that lines that can be cleared easily are not cleared. If a well were to be covered, all the rows which the well spans will be hard to clear. To generalize the idea of a “well”, we define a heuristic which I shall name “bumpiness”. The bumpiness of a grid tells us the variation of its column heights. It is computed by summing up the absolute differences between all two adjacent columns. To ensure that the top of the grid is as monotone as possible, the AI will try to minimize this value. We want to minimize aggregate height, holes and bumpiness, so we can expect to be negative. Similarly, we want to maximize the number of complete lines, so we can expect to be positive. By using this set of parameters and the score formula, the AI can pick the best possible move by exhausting all possible moves (including the lookahead piece) and select the one with the highest score. A standard Genetic Algorithm for real-valued genes would involve searching the entire solution space ( ) for an optimal set of parameters. In this project, however, we need only consider points on the unit 3-sphere (i.e. 4-dimensional unit sphere). This is because the score function defined above is a linear functional and the comparison outcomes are invariant under scaling (of the score function). Suppose we want to compare between two moves, move 1 and move 2, to decide which move is “better” (i.e. gives a better score). Suppose also that move 1 and 2 produces values and respectively. To check if move 1 is better than move 2, we need to check if . If this condition fails then it is trivial to conclude that move 2 is better or equally good as compared to move 1. Suppose is either positive or negative. The better move would then be move 1 and move 2 respectively. Here, we can see how the comparison outcome is invariant under scaling of the parameters – we can multiply by any positive real (scalar) constant and the sign of the above difference will remain the same (although the magnitude differs – but that is irrelevant), in which case the decision does not differ! All parameter vectors in the same direction produce equivalent results. As such, it is sufficient to only consider a single vector for each direction. This justifies the restriction of the search to only points on the surface of the unit 3-sphere, as the surface of the sphere covers all directions possible. We’ll now move on to define the fitness function, selection procedure, crossover operator, mutation operator and recombination procedure used for tuning the AI. The population is first initialized with 1000 unit parameter vectors. For each parameter vector, we run the AI for 100 games, each with at most 500 Tetromino pieces (i.e. 500 at most moves). We let the fitness of any one parameter vector be equal to the total number of lines cleared. The worst possible fitness is , in which case the AI clears no lines for all of the games. Parent individuals are selected for reproduction using tournament selection. We select 10% (= 100) of the population at random, and the two fittest individuals in this subpool proceed on for crossover to produce a new offspring. This process is repeated until the number of new offsprings produced reaches 30% of the population size (= 300). In essence, the offspring vector lies in between the two parent vectors on the unit 3-sphere, but leans towards the fitter parent by an amount that increases with the difference between the fitness of the two parents. This reflects the favoritism of the crossover operator towards the fitter parent. Each newly produced offspring is given a small chance (5%) to mutate. If it does indeed mutate, then a random component of the offspring vector is adjusted by a random amount of up to . The vector is then normalized. As we are working with unit spheres, I would have preferred rotation of the offspring vectors by a certain angle. However, unlike rotations in 3D, 4D rotations are a lot more perplexing. As such, I have opted for the aforementioned more simple mutation operator. After the number of offsprings produced reaches 30% (= 300) of the original population size, the weakest 30% individuals in the population are deleted and replaced by the newly produced offsprings, forming next generation of the population. The population size remains the same (1000). One can then repeat the entire process until the population is fit enough, after which the algorithm terminates. Through the course of this project I’ve tried out some other heuristics such as the highest column height and the number of consecutive holes. It turns out that some of them were redundant, and some of them were replaced by better heuristics (for example, the highest column height heuristic was replaced by the aggregate height), since this produces better results. I would also like to stress that this AI was tuned for a specific set of rules (I defined them in the first few sections of this article). The results may or may not be the same for a different set of rules. 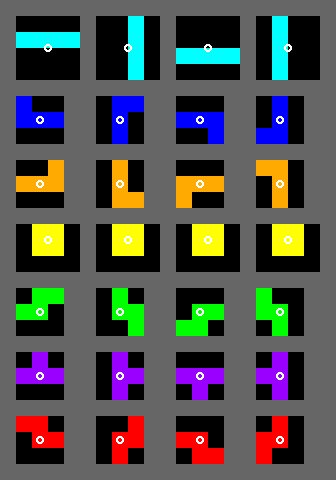 For example, using a naive random piece generator instead may result in an obscenely long sequence of “S” or “Z” tiles which will increase the difficulty of the AI. Allowing more lookaheads will also allow the AI to make more complex moves, in which case it will probably perform better (if properly tuned). As such, when comparing between the results of different Tetris AIs, much attention should be placed on the set of rules used for a fair comparison to be made. This is readily explainable =) Each line will take 20 blocks if the width of the board is 20. Since each Tetromino is 4 blocks, it will take exactly 5 Tetrominos to clear a line. So the theoretical limit is that 20% of the number of Tetrominos will create cleared lines. In practice, this number will be lower since there will be Tetrominos that you placed and were not cleared when you lose. (For example, if you cleared 1000 lines with 5000 blocks but then lost with the next 200 blocks.) But the longer you can survive, the closer you get to this percentage. I noticed the same thing when I was programming a Tetris AI recently, although I was using a different width to the grid so it was a different percentage. Out of curiosity, what’s the average lines cleared for your AI on a normal sized grid? The best I have so far is an average of ~16k lines cleared out of 1000 games. But I didn’t test bumpiness and blockages as part of the scoring as you mentioned here. Also, I didn’t use a genetic algorithm; I implemented what I call slicing for lack of a better word. It’s where I test 100 different values on the first trait, keep the best, then do a test on 100 values for the second trait while keeping the first trait, etc. Doing this requires making a few insane assumptions about the traits being linearly independent, but I found the tests to be easier (at least for me) and the results to be acceptable. That’s a very nice explanation for the 20%, perhaps we could establish some more general relationship which provides the limit for a specific width. I haven’t tested for normal sized grid, but I’ll update it in the future such that the size of the grid can be set. Initially I left out bumpiness as well (too many parameters is a pain when it comes to the genetic algorithm), but when I tried it, the AI seemed to perform better. As for the left-right advantage, nope, I didn’t make it start from the middle as well (because I was lazy too xD). But you’re right, it’s rather unfair. I’ll look into changing the AI’s behavior such that the tetris blocks come down from the center. Hello there once again DPR! This is really good. I would usually turn off the ai and mess him up a little and turn him back on to see how well he could fix it up. Did pretty well can’t get to crazy but yeah. Now what i’m saying is instead of having it speed it up by pushing the down button is for it to push space instead for it to be able to place the block very fast. What if piece selection was not random, but instead tetrominoes were chosen chosen by another AI, one whose “goal” is to make the player lose? That is a good question. In that case, we can redesign the AI to consider the game as a two-player game and to use Minimax instead to compute the score of each decision for each move. It will be quite similar to looking ahead, except that the AI now assumes that the next few pieces are pieces that will minimize its future overall scores. I believe in standard Tetris a long enough sequence of S, Z pieces inevitably leads to a loss so the second AI will always win when that limit is reached. But yet there is one thing that leaves me a bit confused: Shouldn’t there be a difference between the rating of a grid with a big hole and a grid with a small hole? It seems that those two grids get the same grid score. Should’t be the second grid less desirable? You wrote: “The score for each move is computed by assessing the grid the move would result in”. I think a move not finished when the piece is places, but when additionally all the complete lines are cleared. Because (for example) holes that appear when placing the piece can disapper after a line has been cleared. You calculate the grid score without clearing complete lines. Doesn’t that distort the grid score? Indeed, by not clearing the lines first, this particular component appears to have quite a bit of conflict with the other three components. However, for this project, I did not clear the lines first before calculating the score because back then, I had thought that the immediately resulting grid would provide more information for the AI to work with to produce better results. Perhaps by clearing the lines first before calculating the grid score, the “number of complete lines” component may actually turn out to be redundant. It is possible to alter the AI such that it clears lines first before computing the grid score, and such that the “number of complete lines” component is no longer included in the computation of the grid score. By running tests on the altered AI it is possible to determine if it fairs at least as well as the current version. Yeah, i think so too, clearing the lines first before calculation the grid score >might< make the "numberOfCompleteLines" component redundant, because clearing the lines makes the aggregate height become much smaller which is, of course, desirable, making the moves that result in cleared lines have a higher grid score. I think the most interesting question here is: does removing the "numberOfCompleteLines" result in a different bot behaviour? Maybe the best move stays the same when calculating the grid score after clearing the lines. what an awesome project! I’m currently trying to understand genetic algorithms to solve a quite similar problem. What I didn’t quite understand after reading your article is how you computed the Parameters. In your JS code those parameters are hardcoded, so I assume you had some other code that computed them? When I change them the AI still seems to work, just not as good apparently. I would be interested to see how to actually compute them. Unfortunately the computation of the parameters were quite some time ago and I no longer have the code available with me. For the sake of completeness, I may rewrite the optimization code again sometime soon in the future after I am done with my conscription term. The methods used in the optimization were exactly as described in the article and you may refer to them for a general idea as of now. Hey, just wanted to say: Amazing work! I was wondering if you got around to rewriting the optimization code? Ah, got it. Thanks for the reply! Really awesome project and I am a fan of Clannad too! I know this project is very old but if you could consider tetrises and holds that would be excellent. the standard playfield is 10 cells wide and at least 22 cells high, with the topmost two hidden, with this information we need to perfectly stack the pieces in a 9 by 20 playfield and this way we can use the hold option to hold the 1 by 4 pieces and send tetrises whenever we can. By creating code for this your AI will beat any human on earth. Keep up the great work!!! hello,i appreciate your great idea very much, i wonder that if you just use the heuristics formula to achieve your AI, if so，would you please tell me the number of your heuristics lookaheads you calculate for every piece, for i tried use your method to achieve tetris AI without any heuristics lookahead and its failed,Thank you very much! i just read your code,my understand is that in your code the next n pieces is defined in advance rather than random?thank you! Thank you for this. Not only is it interesting, but this may help me with developing an AI for a two-player Tetris game that I am coding. I will give credit for inspiration, but I also hope to be able to use some of the theories/concepts explained within to create my own AI. Regardless, this gave me a starting point to work from, and for that I thank you. But shouldn’t height be counted without cleaned lines or what? Did I miss something?